Non-Fat Farmer Cheese is a perfect variant for overweight consumers as well as for those who are eager to keep fit and healthy! In has been scientifically proved that farmer cheese has a beneficial effect on digestive system. It is especially useful for children and nursing mothers. High content of various nutrients and vitamins makes Farmer Cheese an indispensable product for strong bones and immune system. 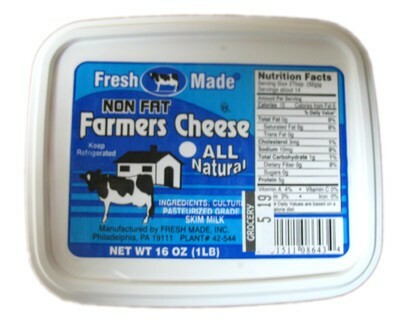 Non-Fat Farmer Cheese is manufactured by Fresh Made which is one of the USA's leading companies involved in dairy industry. This manufacturer is remarkable for its advanced technologies and observance of traditional formulation. Today Fresh Made production is known and appreciated world-wide. INGREDIENTS: Cultured Pasteurized Grade A Nonfat Milk. All the food and products arrived in good condition and great, however one package of farmer cheese was broken by FedEx delivery and I had to throw it away. Upset with delivery! This is not the first time when fedex delivers fragile boxes broken!! !